Saba is the northernmost volcanic island in the Active Arc of the Lesser Antilles with an area of only 13 sq. km and a population of around 1200. It is rhomb shaped and is a single volcano measuring 4.6 km east to west and 4.0 km north to south rising to a central peak of Mt. Scenery at 887m. The island has a permanent population of around 1,100 but the presence of a medical college and tourists can double this number. The appearance of the island is that of a deceptively simple stratovolcano, but this is not the case as it has been built up of a large number of Pelean domes with their aprons of coarse pyroclastic deposits that form a distinctive shoulder on the island at about 450 to 500 m a.s.l. Mt. Scenery is a younger cone perched somewhat eccentrically to the north on this foundation of Pelean domes. A prominent sector collapse scar exists on the south-western flanks of the volcano in which the island’s administrative capital sits. The upper part of this scar has been buried by the younger deposits of Mt. Scenery and the lower part by the Pelean dome and pyroclastic aprons of Great, Bunker and Paris Hills. 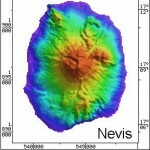 The submarine flanks of the island slope away uniformly in all directions, except the west where about 1.3km offshore there is a single parasitic conical submarine Pelean dome rising from depths of 300m to only 23 m below sea level. The island is essentially a complex of andesite Pelean domes with their aprons of block and ash flow deposits, together with a few domes that have produced short thick dome flows that are steeply inclined on the island slopes. From a suite of 96 samples only two were basalt and both came from the oldest volcanioc center on the island at Torrens Point. Lavas of basaltic andesite composition are sparse, as are basaltic andesite pyroclastic deposits (resulting from St. Vincent-style activity). However a prominent basaltic andesite lava flow dominates the northeast quadrant of the island with the island airport built on its distal part.. Dacite is present mainly as pumice and ash which together with some andesite reflect Plinian-style activity. Also present in small amounts are semi-vesicular andesite pyroclastic deposits (resulting from Asama-style activity. The stratigraphy of the island can be subdivided into two parts. The older parts of the island predate the sector collapse scar and the younger deposits that postdate the scar and include Mt Scenery. The rocks of the island have proved too young to be dated by the K-Ar method as they are less than 1 million years old. Recently three 39Ar/40Ar ages were determined for the older parts of the island and yielded ages of 0.42, 0.36 and a third sample that yielded 0.21 and 0.13 million years. The age of the sector collapse scar is estimated at around 100,000 years and younger deposits have been dated by radiocarbon methods. 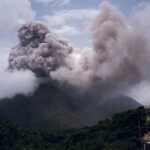 Saba island has erupted lavas of a single magma series which is medium-K low-Ca calc-alkaline. The compositional range is from 49% SiO2 to 65% SiO2, and the lavas are characterized by an abundance of rounded medium-grained hypabyssal (dike rock) nodules that are more mafic than their host. Hot springs are present on the northwest and southeast coasts of the island and on the sea floor immediately offshore of these areas. 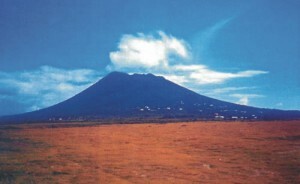 Orange areas of discoloration are present on the flanks of the volcano marking the sites of former fumarolic activity. On the northeast coast immediately underlying the prominent basaltic andesite lava flow, is a layer of yellow sulfur mineralization that has been mined in the past. The island appears to overlie a NE-SW fault zone as indicated by recent seismic activity and the distribution of hot springs along the longest axis of the island. The oldest dated rocks on Saba are around 400,000 years. Because there are no flank deposits rich in carbonised wood, pits were dug on the island to locate the youngest pyroclastic deposits. 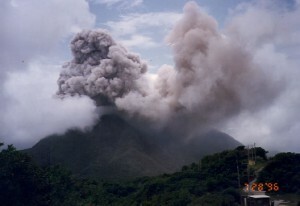 In a pit dug within the island capital of The Bottom, the youngest pyroclastic deposit was found to be a thin ash surge with accretionary lapilli (dated at 280 years B.P.) that overlies Amerindian remains but underlies deposits containing European debris following European settlement on the island in AD1640. European settlers may have been particularly attracted to the island by the presence of meadows of grassland instead of tropical rain forests. These meadows resulted from pyroclastic flow eruptions shortly before European arrival and before the rainforest had re-established itself. Between 1995 and 1997 an increase in the number of local earthquakes was associated with a 7 to 12 degree Centigrade rise in temperature of the hot springs . The seismic activity that was felt on Saba is thought to represent a mild volcano-seismic crisis, with the increased heat flow resulting from either deeper circulation of ground water or possibly renewed magma movement. 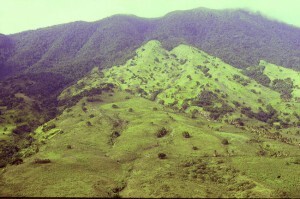 The volcanoes of the northern Lesser Antilles are built upon broad platforms of submarine banks where Mesozoic volcanic and sedimentary rocks are capped by Tertiary limestone layers. 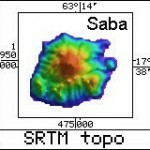 This platform is well known in the Saba Bank (13.5km southwest of Saba) standing around 1000m above the sea floor, measuring 70 km east-west and 40 km north-south and with a minimum water depth of only 20 m in the south and 40m in the north. It has been drilled for oil so that its stratigraphy which includes Mesozoic rocks is known. The presence of the underlying bank is indicated on Saba island by the presence of a rare and exotic suite of crustal inclusions contained in the volcanic deposits. These include Tertiary fossiliferous limestones, sheared plagiogranite, a biotite-hornblende-clinopyroxene adamellite and hornfels. The presence of the rounded hypabyssal nodules belonging to the same magma series as the volcanic rocks suggest the presence of composite dikes beneath the island. Also the shape of the island, the distribution of hot springs and the locations of recent seismic epicenters all suggest that the island is built on top of an ENE fault that cuts the underlying submarine banks. 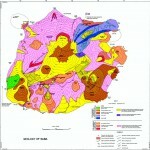 Magma is stored in this fault zone in the form of vertical sheets or dikes in which several magma compositions coexist. For an up to date evaluation of the volcanic hazard the reader is referred to the soon to be published: Lindsay. J., Robertson, R., Ali, S., and Shepherd, J. 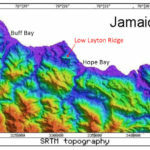 (Eds), in press, Volcanic Hazard Atlas of the Lesser Antilles: Seismic Research Unit, University of the West Indies, St. Augustine , Trinidad , W.I.